The PVC hoops will support plastic netting which will (hopefully) keep the deer out. As an aside, if any of you are familiar with Denver, you might recognize the Blue Bear looking out the window. The real Blue Bear is located at the Colorado Convention Center and stands 40 feet tall! I fell in love with him while I was in Denver for business last October and decided to take a mini bear home with me. 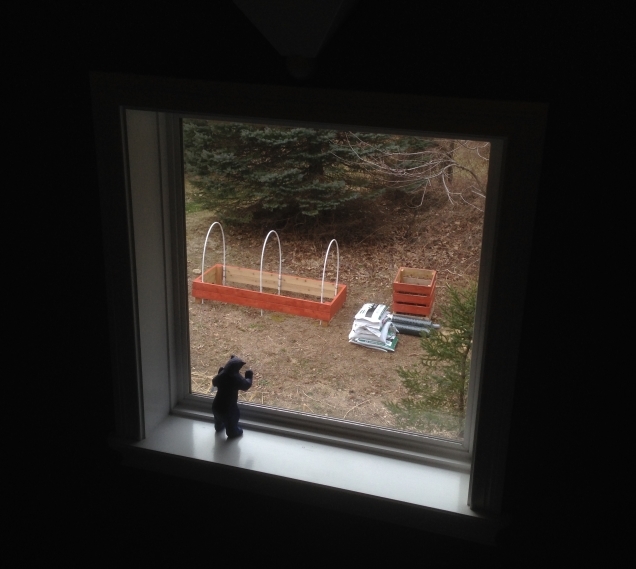 This entry was posted in Blog Update and tagged blue bear, gardening, raised bed. Bookmark the permalink. ← Is Spring really, really here?! ?